InstaForex customers can download and install a free app developed by the company’s programmers. To quickly access up-to-the-minute information, use InstaForex Quotes and News for Android! Using this app, you will be able to stay abreast of the latest financial news and analyze a current market situation. InstaForex Quotes and News enables you to get all the necessary market data and quotes, thus providing you with ample opportunities for efficient trading. - Real-time interactive price charts. Analyze the market and get profit using InstaForex Quotes and News! Powerful trading tool is now there for you! A universal solution for InstaForex clients will be your reliable assistant in trading. Mobility and quick response to a changing situation is an undeniable advantage. InstaForex Quotes and News: reliable assistant on your favorite device! InstaForex covered this year's Dakar Rally in order to provide its customers with play-by-play reviews of how the events were unfolding. Together with you we rooted for InstaForex Loprais Team which became a regular participant of this thrilling off-road race. Just like organizers promised, it was a difficult competition for all the teams without exception. In addition to rough tracks and harsh weather conditions, which tested their truck’s limits, racers also had to cope with strenuous physical exertion and sheer weariness. Competitors jostled till the very last minutes of the race. Our team was held up as true professionals pushing their strength limits. Even an unexpected breakdown of the Queen 69 on the penultimate stage, which threw the team back to the last position, was unable to break their fighting spirit. In the final, the team was 6th overall. It was a fierce competition but InstaForex Loprais Team got over the hump. However, we will keep on hoping that the next year’s Dakar will be more successful and our guys headed by Ales Loprais will win a podium place. For now, we want to express our gratitude on behalf of InstaForex Loprais Team to all supporters, friends, and fans that closely followed the ups and downs of the race and believed in our victory till the end. We could hardly be where we are now without this warm support. InstaForex and its partners have responded in kind, preparing special prizes for the winners of a traditional after-race quiz. The team’s leader Ales Loprais will hand over the prizes at a fan meeting that will be held on February 1, 2014. We look forward to seeing you at the 2015 Dakar opening ceremony! InstaForex is happy to announce the third season of the international award Analyst of the Year 2014. Everyone specializing in market trend predictions and quality forecasts is allowed to take part in the competition. As usual, the main condition for participation in the Analyst of the Year is publication of market analyses, updating the Trend and News profile, and blog posting and forum thread renewal on mt5.com. Over the whole year, mt5.com visitors will choose the best experts in an open vote. At the end of voting, seven contenders with the highest rating (number of votes) will be determined as the winners and rewarded deposits on their trading accounts. The prize pool is $45,000 and split into seven parts: the 1st place - $15,000, the 2nd - $10,000, the 3rd – $7,000, the 4th - $5,000, the 5th - $4,000, the 6th - $3,000, the 7th - $1,000. To learn more about the requirements and the rules of the competition, go to the Analyst of the Year web page on mt5.com. Make your contribution and vote for the best expert in 2014! It is time to announce the winners of the latest competition week. The coveted prizes are awaiting the lucky traders. InstaForex believes in each contestant. Maybe next time luck will be on your side. Here are the lucky ones! InstaForex would like to congratulate warmly this week’s best traders. Let’s wish every success to those who were not so lucky this time. Options trading is a hit of InstaForex contests and campaigns. The number of its participants is growing day by day. As usual, to make a success of this type of trading, all that you need is to react immediately, be focused and confident. Besides, you should have sort of scent of short-term deals. This time, Igor Moskalenko scored a victory! Congratulations! InstaForex pays compliments to the winner and says to all the rest: never give up! The next stage of the contest will take place very soon. The registration will last until April 2014 (GMT+2). Hurry up! Setting a target and reaching it is half the battle when you compete for the victory in the InstaForex Sniper contest. Each week the competition, which is gaining in popularity, attracts even more contestants. The rivalry was fierce, but Stanislav Vasilenko was the most accurate. Congratulations! The next stage will be held on April 14-18, 2014 (GMT +2). Try your hand at InstaForex Sniper right now and, maybe next time you will see your name in the winners’ list! Lucky Trader is one of the most exciting InstaForex contests! There is no shortage of traders to partake in the competition. The latest step was no exception. Ahmed Fakhry Mohamed was the one who took the first place trophy! Strike out for the contest and try your luck at the next step taking place on April 7-18, 2014 (GMT +2). You still have a fighting chance of winning your slice of the Lucky Trader pie. Join the battle for the prize and broaden your trading experience! Registration is available on the corresponding page. Real Scalping, which is one of the oldest InstaForex contests, has appealed to lots of traders throughout its existence. Scalping is a widespread trading method used by millions of traders around the world. InstaForex offers its clients to take part in the Real Scalping contest to give scalping a try and fight for a money prize. Bogachenkov Vsevolod Alexandrovich demonstrated his great skills and aced his closest rivals out. Congratulations on your well-deserved victory! Those who did not get lucky this time, register for participation in the step, which is set on May 5-30, 2014 (GMT +2). Registration is available on the contest’s page. InstaForex informs its clients of a new feature in Client Cabinet that makes possible to open deals and place pending orders. By filling out a special form, InstaForex customers can now trade directly in their Client Cabinets. The opened deals and pending orders will be shown in the Current Trades section of Client Cabinet. Moreover, you can close trades or cancel orders. Below on this page, you can select a time period for the chosen financial instrument. With the new feature of deals opening and placing pending orders in Client Cabinet, trading has become even more convenient. InstaForex gladly informs its clients and partners about a great addition to the list of CFD instruments available for trading. The list was added with 40 new CFDs on shares of the companies quoted on the major world stock exchanges — NASDAQ and NYSE. China Mobile, Facebook, FedEx, Goldman Sachs, MasterCard, Morgan Stanley, Nike, Starbucks, Tesla Motors, Twitter, Visa, Yahoo, and other leading corporations are among the companies, shares of which are now available for InstaForex clients. InstaForex always develops new and improves already existing products and services to make the work of its customers much easier and the most effective. InstaForex, and legendary Liverpool Football Club announced a two-year partnership today that will run until the end of the 2015/16 season. 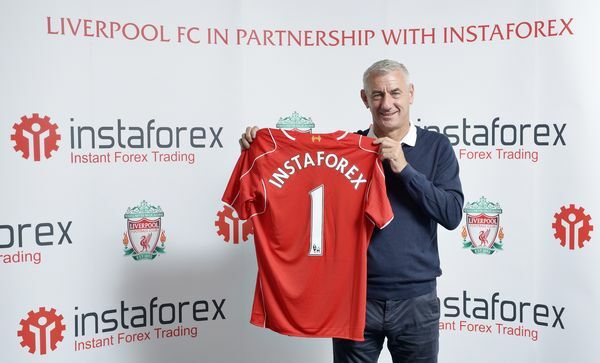 InstaForex will become the Official Online Forex and Binary Options Trading Partner in Asia and the Commonwealth of Independent States (CIS) of Liverpool FC. The new alliance will see InstaForex offer exciting LFC experiences to their customers who are fans in these markets, including tickets to see the Reds play at home in Anfield. “We are delighted to welcome InstaForex to the Liverpool family as our very first online Forex trading partner. The online service has over 1.2 million online customers and those in Asia and CIS will benefit from this partnership, which will see InstaForex offering fans content and access to the team they love” commented Chief Commercial Officer of Liverpool FC, Billy Hogan. Founded in 1892, Liverpool FC is one of the world’s most historic and famous football clubs having won 18 League Titles, seven FA Cups, eight League Cups, five European Cups, three UEFA Cups, three European Super Cups and 15 Charity Shields. Miss Insta Asia online beauty contest, the unrivalled InstaForex’ project, has nearly approached the final stage. We would like to remind you that scores of the fifth season competition will be announced within 14 days after the challenge is officially completed. Despite the upcoming finish, absolutely any contestant has an even chance of winning the new Insta Asia title. Indeed, ranks might change any minute due to fierce competition and vigorous voting. Please, be aware that in recent months, ranks have shuffled greatly and new contestants have moved to the forefront. Currently, Natalia Pototskaya from Ukraine is holding firmly the leadership having gained over 6,000 scores. Olga Lazepnikova is ranked second followed by Tatyana Zaharchenko with a narrow margin. As a result of open online voting, the contest administration is about to determine five winners who will share the nominations and prize pool of $45,000. So, less than one month is left at our disposal. Each contestant is capable to make an impact on a voting outcome. How to increase your chances to win? Update your profile with new photos and try to do your best to get as many scores as possible. Besides, traders holding an account with InstaForex can also affect current voting and reorder ranks. According to the rules, their vote is crucial. Please, do not waste your precious time! Hurry up to support your favorite girl! Who deserves the crown and the Forex Queen title? The mystery will be unveiled in just a three weeks as the long-awaited final of Miss Insta Asia 2014 is around the corner. InstaForex announces a considerable reduction in spreads of currency pairs with the Swedish krona as part of a constant work on optimization of trading terms and due to external market factors. There is a reduction in virtually every trading instrument with this currency. New spreads come into effect September 9, 2014. Please pay attention to these changes and adjust your trading strategy if necessary. InstaForex is glad to announce the start of the sixth annual online beauty contest Miss Insta Asia 2015. The new season will start on October 1, 2014. This date was chosen not accidentally. Throughout the history of the competition, this date was crucial for contestants as results of Miss Insta Asia were summed up. The extraordinary and fascinating online contest Miss Insta Asia became even more popular during its existence. Participants from all over the globe declare their elegance, beauty and grace. Connoisseurs of beauty will see even more charming ladies from different countries: Indonesia, Malaysia, the Philippines, Iceland, the UK, the US, Russia, Ukraine, Latvia, Iran, India, and China. Dive into the world of beauty. Vote for one or several contestants you like most! The format, terms and rules of the online beauty contest are the same. The victory and prize pool of $45,000 will be shared between Miss Insta Asia, two Vice Misses, Forex Lady, and Insta Choice. The most beautiful ladies will be determined by the results of an open online voting. Note that InstaForex traders have a privileged vote. Maybe it will be you to determine the distribution of places for the most gorgeous contestants of Miss Insta Asia 2015. If you want to take part in the sixth season of the contest and jostle for the title of Miss Insta Asia 2015 or if you want to influence the current rating of the contestants, please visit this website.